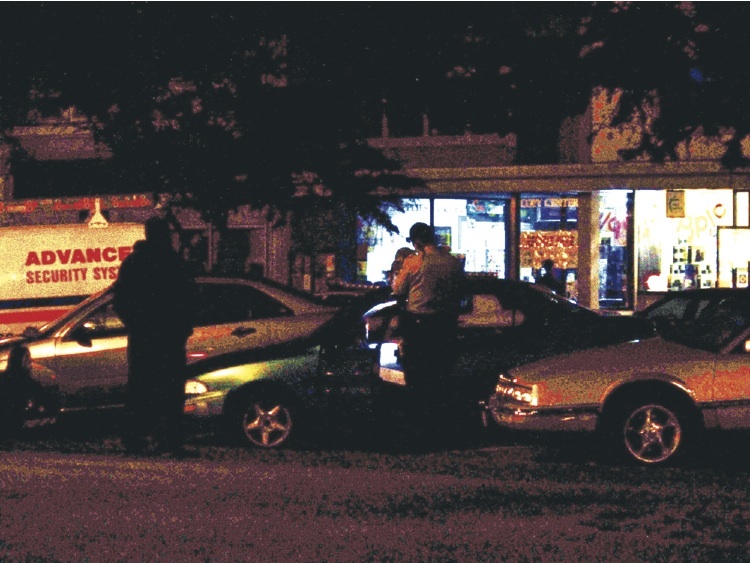 ARCATA – Next time you hook up for pot in a bar, consider not consummating the transaction in front of a bunch of cops. You’d think that would be covered in Dope Dealing 101, but maybe the two suspects arrested on the Plaza skipped class that day. The scenario began with an unrelated smash and grab burglary from Simply Macintosh, located on the Plaza’s west side, the just before midnight on Saturday, Sept. 11. Unknown suspects first attempted to disable the store’s security system, then smashed the glass front door. 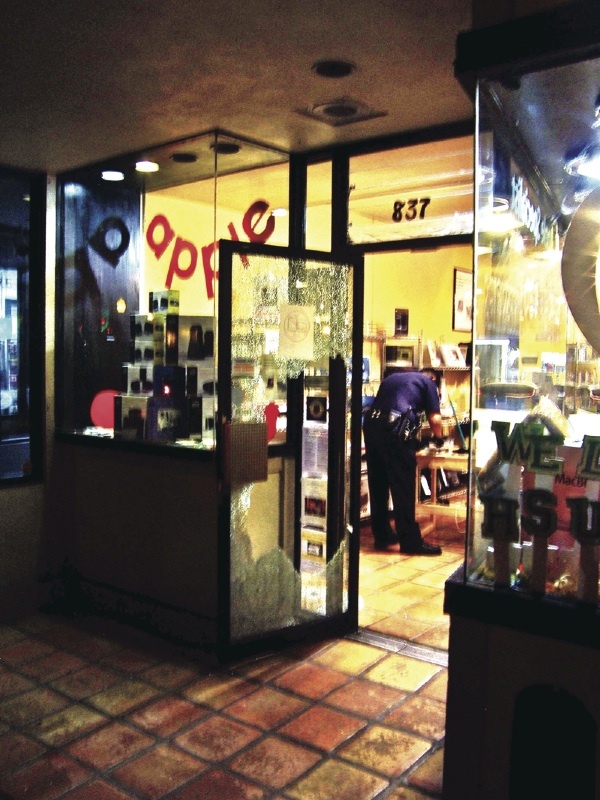 With the alarm blaring, the crooks entered the store and stole a demo iMac valued at $1,300, an old, broken PowerMac tower used as a window display and a backup power supply. The serial number for the stolen iMac is W89438EPB9U. APD Detective Sgt. Todd Dokweiler said no suspects have been identified. As police investigated the burglary, Arcata Kineticab operator and City Council candidate Mark Sailors happened to be nearby waiting for fares on the typically busy weekend evening on the Plaza. As he checked out the burglary aftermath, taking some pictures from across the street, a small blue car pulled in to a vacant parking space in front of him. Sailors was astonished at at the car occupants’ obliviousness to their cop-rich surroundings. He said that even when an APD K-9 unit pulled in behind them to further assist with the nearby crime scene, the parked potsters didn’t cease the high-profile dopely dealings. “I’m standing in front of their car taking pictures, with shots going off every few minutes,” he said. But the bud-slinging continued uninterrupted, “like the cops will have no problem with them doing this or do anything about it,” Sailors marveled. But, perhaps excited by pot fumes emanating from the car, the APD K-9 started barking and an officer returned to the area for a look-see. More officers were radio’d in, and the car occupants eventually extracted and sat on the curb as the car was searched. After locating what Dokweiller said was a “couple ounces” of marijuana, officers arrested Matthew Lewis Mansur, 24 on a felony charge of marijuana possession for sale. His listed address is 501 Ninth St., the location of the Arcata Service Center. Across the street, cannabis interruptus. Arrested on a charge of possession of concentrated cannabis was Whitney Kyra Steinbach, 28, of Venice, Calif. She allegedly had about two grams of hash, and her possession charge will likely be reduced to a misdemeanor. This entry was posted on Wednesday, September 22nd, 2010 at 8:21 pm	and is filed under News. You can follow any responses to this entry through the RSS 2.0 feed.